I have decided to make this new thread to present and discuss a number of recent, primarily archeometalurgical studies that shed more light on long distance bronze-age trade connections across Europe. This thread is meant to complement, not to replace, related threads, especially on the diffusion of metallurgy (which deals with a different, earlier time horizon), and the bell-beakers (which deals with a singular, albeit important aspect of these networks). Results depend on the selection of ore sources considered. Some sources appear to have similar signatures (e.g. Crete and Mansfeld/ Harz https://archive-ouverte.unige.ch/unige:15011, or the Massif Central and Sardinia). As such, all links established so far should be considered as possible rather than certain. Recycling of material seems probable, if not even likely. As such, copper artefacts may actually contain copper from various sources that may be difficult to distinguish in ex-post analysis. If copper ores occur in close proximity to uranium ores, their distribution of lead isotopes will vary widely due to radioactive exposure. Such ores are very difficult to identify. This concerns, among others, ores from Wales, Cornwall, Brittany, the Massif Central, the Erzgebirge and some parts of the Harz mountains (http://www.aditnow.co.uk/documents/p...st-England.pdf). Thus, the fact that the a/m places have not been identified as copper sources does not necessarily mean they were not producing and trading copper in ancient times. It has been commonly assumed that all impurities stem from the copper, while the tin used for alloying was pure. This relates to the fact that pure tin deteriorates naturally (below 13°C it gradually becomes a powder), while tin with a lead content above 0.5% doesn't. As tin ingots have only been found in exceptional cases, it has thus been assumed that most of the traded tin was so pure that it has deteriorated in the meantime. However, recently tin ingots with 1.5% lead content have been found in the Tollense river in Mecklenburg (http://www.researchgate.net/publicat...eastern_German). Moreover, there is the possibility that, instead of refined tin, Cassiterite (SnO2) ore has been used for smelting bronze. Cassiterite is very hard, washed out of the veins and accumulates in streams. Its tin weight content is quite stable around 79%. Thus, producing regions may have refrained from cumbersome refining, and shipped alluvial ore deposits instead. In any case, there is the possibility that bronze impurities did not only result from the copper, but also the tin used. Thus, a good part of the results published so far, especially those on bronzes with high tin content, may require review as concerns the possibility of lead input from tin. In summary, this is still very much work in progress, and it is advisable to treat findings with some care. Accumulated data from Swedish bronze artefacts reinforce the view that all metals used in casting were imported (Figs. 12e16, Table 3). However, the presence of the copper slag from Botkyrka (T1:59) provides possible evidence of an attempt at smelting of the local ores in LBA, although such an attempt is not reflected in any of the analysed casting debris from the same site, or from any other BA site in Sweden. It is important to stress that the Swedish sulphide ores are highly complex mineralisations containing both copper and iron. These ores are difficult to reduce and at least four consecutive steps of roasting and smelting are required to reduce the sulphides to metal. This technologically complex procedure might have prevented a local extraction of copper during Bronze Age. This article has demonstrated that there was early copper-based metallurgy – melting and casting – during the Bronze Age and probably already in the Late Neolithic II in Sogn, Norway – as there was a number of other places in Scandinavia. It is also demonstrated, based on ethno-historical studies and mine records, that there were local sources of readily extractable copper in Årdal, and that several of these would have been accessible to and could have been identified by the local Bronze Age inhabitants. (..) This article does not prove that copper sources were exploited in the Bronze Age. (..) This article suggests that it is reasonable to assume some level of copper extraction, and that a programme to seriously investigate the matter should therefore be initiated. It furthermore needs to be noted that Northern Sweden, where several copper mines, including Europe's largest open pit copper mine, are currently being exploited, has not yet been investigated. Northern Sweden shows a peak in I2b frequency, and the I2* distribution generally tends to correlate to prehistoric mining. Nevertheless, current research indicates that during the bronze age, most of the material used was imported into Scandinavia. More on that in the nest posts.. Upon establishing that most of the copper used in bronze-age Sweden had been imported, the researchers carried out archeometalurgical investigation on probable sources. While the map displays considerable sourcing from the Massif Central, more specifically the Montagne Noire, the text assigns the respective finds to Sardinia, since ores from both locations have similar signatures, and there is so far no evidence of bronze-age copper mining in the Massif Central. Moreover, only three finds could have possibly originated from the Massif Central, compared to at least 15 for Sardinia. As such, the map is understating the relevance of Sardinia as supply source. As concerns the Eastern Mediterranean, only a single find could be attributed to the Greek mines in Laurion. The map's emphasis of Laurion is rather motivated by the fact that axes similar to the one found in Sweden that was made from Laurion copper are "common in Britain". Cyprus (5 finds), OTOH, seems to have been a relevant, though not the main supply source for Sweden. As concerns the British isles, aside from the tin ingot, one copper melt found at the same location has been determined as originating from Cornwall. For a handful of other finds, British origin (Cumbria, Wales, Ireland) seems possible, especially if ores have been blended or recycled, but the study ultimately assigned them to Tyrolia, the Iberian Peninsula and Sardinia, respectively. Germany: Asides from one find made from Siegerland copper, for a second find with very unusual trace element and isotope ratios the study lists the Black Forest (Grube Clara) as the closest match. Erzgebirge ores could be excluded, but the study does not discuss the Harz mountains (which are known to among others have supplied Pomerania and Bohemia during the bronze age) as possible source. Other regions: For the analysed artefacts, Liguria and Tuscany, as well as the Balkans (Serbia, Bulgaria) could be excluded as supply sources. For the Carpathians, evidence is a bit less conclusive:" Only a few of the Swedish copper-based artefacts analysed fall into the general ranges of lead isotope ratios of the ores from the Carpathian Mountains (Romania and Slovakia), and none of them is fully consistent with the data for these ores." "We were also allowed to make comparisons with new unpublished lead isotope data for the Bronze Age copper based artefacts from sites in the Ural Mountains and the local ores - they are isotopically different to the Swedish bronzes". In summary, the study reveals a complex and far-reaching supply network. Tyrolia, the Sierra Morena and Sardinia emerge as main copper sources, but are temporarily and/or occasionally complemented by copper from NW Spain/ Portugal, the British isles, Germany, the Eastern Mediterranean, and possibly the Massif Central. Additional sources, e.g. the Carpathians, may appear when further artefacts are being investigated, as the authors have announced to do. Cornish tin ingots have been confirmed to have been traded to Sweden during the late bronze age. The Swedish study furthermore analysed supply routes, and how they had evolved over time. In the light of the presented observations, and that the inferred source areas for metals are widely apart, we will argue for the possibility of two major systems of metal flow from Europe to Sweden in the Bronze Age (Fig. 21); one Atlantic (maritime) and one via Central and south east Europe (amber routes, overland/ riverine). Related to this, is the existence of the continental amber routes which are well documented (Du Gardin, 2003; Kristiansen, 1998). It is notable that the main episodes for the traffic of amber to the Aegean world 1600, 1500 and 1200 cal. BC correspond well with the dating of some of the Scandinavian BA artefacts that in turn match the ores in Cyprus. In the Middle Bronze Age (1500-1000 BC), supply from Cyprus and Tyrol gets rarer, and disappears completely after 1300 BC. The same applies to Asturias/ Galicia/ Northern Portugal. Sardinian copper continues to be present, but is now found alongside copper from Southern Spain. In fact, Southern Spain and Sardinia appear to have been the only supply sources between 1300 and 1100 BC. The breakdown of continental and especially Eastern Mediterranean copper supply is probably linked to contemporary events like the attacks of the "Sea People", and the battle at the Tollense river in Mecklenburg. The Western, "maritime" route apparently remained widely unaffected by these events, and benefitted from the breakdown of continental networks. However, the appearance of copper from Southern Spain during the MBA suggests a re-routing around the Iberian peninsula instead of passing overland north of the Pyrenees. Possibly, during the EBA, the western maritime route only went from Asturias/ Galicia to Scandinavia and didn't reach into the Mediterranean. As such, the description below might rather refer to later developments of this route. The western ‘maritime route’ could have been established already in the Neolithic by ‘Beaker’ groups (..) Thus, the metal from the west Mediterranean World could either have been channelled via the route “south France-Garrone axis-Brittany-the British Isles and Scandinavia” or via the Atlantic communities northwards. In any case, the British Isles would have had a very strategic position in this north-south network and the strong connections between British Isles and the west Mediterranean World in the Bronze Age is therefore of greatest importance. An important observation in the context of the connections between British Isles and Scandinavia is the consistency of the lead isotope composition of the tin ingot from Vårdinge in Sweden (T1:60) with the ores from Cornwall. Actually, the availability of tin might be the reason why several copper producing areas directed their ‘copper routes’ to pass the British Isles during the Bronze Age. Probably, “traders” were in many cases not searching separately for tin and copper, but were receiving the two metals from nearby ports, stressing the possibility that ports in the British Isles acted as transit centres for copper from other parts of Europe as well as providing local tin ore. It is important to recall that the Central European networks were the ones that delivered most of the finished artefacts to Scandinavia throughout the Bronze Age (Kristiansen, 1998; Thrane, 1975) but, in terms of abundance, Nordic forms dominate from about 1700 BC and onwards. This situation, together with evidence from the existence of local workshops, strongly indicates that most of the metal provided as raw material/ingots was cast into “Nordic" regional forms. Could this indicate that the Atlantic network foremost provided Scandinavia with ingots of bronze, copper and tin whilst the Central European systems delivered both finished artefacts and ingots of metals? The best-documented road has been recorded in the Tabula Peutingerania. It started in the Adriatic port of Aquilea, and bypassed the Alps via today's Ljubljana, Pluj, Szombathely and Sopron to reach the Danube at Carnuntum. The Roman part was part of the Imperial road network, and officially labelled Roman amber road. Its continuation beyond Roman borders is less well known, but recorded and identified town names on Ptolemy's map suggest that at least one major branch followed the Morava river to Brno (Eburodunum), passed through the Moravian Gate to the upper Vistula, and reached the West Prussian coast via Kalisz (Calissia) and Bydgosz (Ascaucalis, today Osielsko). Brno (Eborodunum) and Kalisz (Calissia) were two of the three main cities in Germania according to Ptolemy. While that road has probably already been used before Roman times, the main Bronze Age roads run further to the West. A trade route connecting Carnuntum via Brno, Prague (Ptolemy's Casurgis), and Dresden (Ptolemy's Lupfurdum) and then along the Elbe to Hamburg (Ptolemy's Treva) can archeologically be proven to have existed as early as 2500 BC. The lower Elbe was an important junction not only for trade into Scandinavia, but also with Britain (tin!). Moreover, Greek mythology suggests that most amber traded in pre-roman times originated from the North Sea rather than the Baltic Sea. While by-passing the Alps, the eastern route via Carnuntum was longer, and also went far eastwards of the Tyrolean copper mines. Thus, an alternative route via the Inn valley and the Brenner pass developed, which southwardly either went to Venice, or into Tuscany and central/ southern Italy. North of the Alps, it also branched. The eastern branch (well documented by finds of Tyrolean copper ingots) went towards Linz (Roman Lentia), across the Bohemian Forest to Budweis (Ptolemy's Furgisatis) and then to Prague, where it connected with the Elbe route. Other branches followed the Inn river to Passau (Castra Batavia, Boiodorum), either crossing the Bohemian forest there into Bohemia, or following Danube, Regnitz, and Saale via today's Regensburg (Castra Regina), Bamberg (Menosgada) and Jena (Bicurgium). This route reached the Elbe near Bernburg, in Ptolemy's Luppia, which he listed as the third of the three main cities in Germania. At latest by 600 BC, a more westerly route along the Rhone and Rhine or Maas developed, which quickly gained popularity with the Greek establishment of Massilia. The establishment of Massilia also allowed to trade Cornish tin directly via Seine and Rhone to the Mediterranean, by-passing Southern Germany, and is frequently cited as a possible reason for Celtic migration from the upper Danube into France and Britain, to re-gain control of that trade. Finally, there were two easterly routes, which widely bypassed continental copper sources, but may especially during the early Bronze Age have been used to trade amber against Greek and Near East metals. One of them followed Vistula and Dniester, The other one went even further north-easterly, via the Nemunas or the Dina to the Dnieper, and from there either into the Black Sea or the Caucasus. Baltic amber has found as far to the south-east as Ossetia. Thanks for the corrections. I confess I am more acquainted with the pre-Roman geography north of the Alps, but the advantage of such a forum is the opportunity to learn from others. Aside from the Baltic Sea coast east of the mouth of the Vistula, major alluvial amber deposits exist in the moraines created during the LGM, especially the Eberswalde-Torun Urstromtal that extends west-easterly across Eastern Germany and Poland. Archaeologists suppose a major prehistoric amber collection and trade centre in the Bydgosz-Torun area (possibly Osielsko / Ascaulis). Another major Polish amber hoard (300 kg) has been discovered in Basonia on the Vistula south of Warszaw. Dated to the 5th century AD, it indicates the use of the Vistula-Dniester-route during the late Roman age. More on the German routes: Below is a mapping of specific amber objects, so-called "Bernsteinschieber" (rectangular collier elements), that have been found as far apart as in Mykene, the Stonehenge area and the Orkneys (approx. 1600 BC). Note that the highest diversity is between Rhine, Main and Inn. The Mykene / Stonehenge type (circles) is also found on the Main and the Upper Danube. The research paper (in German), from which the map is extracted, argues for originally British design that has been adapted and partly modified in Central Germany. The distribution map demonstrates the existence of an amber route from Cornwall via Rhine and Danube to Mykene, which most likely also served for tin and copper trade. As to the source of amber - further below a distribution map of Nordic full-handed bronze swords (around 1200 BC). Aside from indicating that these were anything but peaceful times, this is a massive occurrence of bronze objects in an area that lacks tin and copper resources. Nordic people obviously had a valued trade commodity, namely amber. Note the concentrations along the Lower Elbe and Lower Oder, south of the Lower Elbe along the Ilmenau ("Bardengau", presumed iron-age homeland of the Lombards around Bardowick), and down from Rügen and the Rostock area to the confluence of Elbe and Havel. From there, the distribution thins out, but the connections along Elbe and Morava towards the Danube, along Saale and Regnitz towards Tyrolia, and also along the Rhine and through Switzerland are well visible. 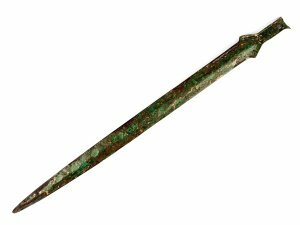 Further such swords have been found in considerable concentrations on Sardinia, along the Italian East and West coasts, in Greece, Crete, Cyprus and Egypt. Some observers take this as indication of a Nordic origin / relation of the Sea People, but it may as well just show that amber traders were well-armed during these dangerous times. Last edited by FrankN; 14-06-14 at 20:11. Before leaving the amber routes, it is worthwhile mentioning that during the last years, quite some effort (some serous, some rather amateurish) has gone into identifying amber-related toponyms along documented or hypothesized amber roads. The Germanic name for amber is "Bernstein" - the burnable stone, and it has been suggested that many places with "Brenn-", "Bern-" or related forms in their name point to a role in amber trade. Among the plausible suggestions that are accepted among many archaeologists is the eastern transalpine route from Verona (German"Bern") via the Brenner, to Innsbruck, and further onwards via the "Fernpass" to Augsburg and the upper Danube. For towns along the Western Alpine passes, such as Berne or Brienz in Switzeland, the connection isn't implausible either, though I start to get sceptical when people interpret St. Bernhard (the mountain pass) as an amber name. Before going into further detail, note that around the Mediterranean, amber was in antiquity known as electrum. Its electrostatic properties later lead to transfer the name onto a physical phenomenon that today is known as "electricity". As such, I think it is rather futile to try to find amber names along the Mediterranean coast, though fire (old greek: pyr), burning etc. relate to a common IE root, so there is a slight chance that the "burnable stone" has also brought forward related toponyms there. It is actually unclear to me which word the Continental Celts, masters of the iron age amber trade, used. English Wikipedia suggests that "amber" is actually a borrowing from Arab - they used "ambar" to denote a waxy whale excrement used in perfumery (ambergris), and since both ambergris and amber are waxy substances collected on the shore, the name was transferred from the one to the other sometimes during the middle ages. This sounds possible. However, as "ber" relates to a common IE root, and the Germanics, from which the Celts collected the stones, called it with that root already, Continental Celts may also have maintained that root as "amber". So, as you see, there is still a lot of speculation associated to "amber names". Pärnu (Estonia) - Brandenburg (Königsberg) - Braniewo (Brennsberg) - Brusy - Bydgoszcz (Bromberg) - Barcin - Wrzesnia - Wreschen - Prosna - Berndorf - Wroclaw (Breslau) - Bernstadt - Broumov (Braunau) - Brandys - Bystrice nad Pernsteynem - Pernstejn - Brno (Brünn) - Slavkov u Brna - Breclav (Lundenburg) - Bratislava (Pressburg) - Parndorf - Brennbergbanya - Sopron - Bernstein - Brestanica - Bresternica (= Maribor) - Aquileia. Some suggestions are pretty unlikely - there is, e.g., a couple of more plausible explanations for the name "Hamburg" than deriving it from "amburo", especially since we know from Ptolemy that in antiquity it was called "Treva", relating to its position at the crossing of three major amber roads (along the Elbe, down from Jutland to the Western Harz, and from Lübeck on the Baltic Sea towards the Rhineland). Berlin is most likely derived from old Slavic 'berlo' (swamp, wetland), and not from amber. And if Antwerp (Spanish Amberes) is really an amber name, I also doubt.. The antique Greek name of the Dnieper, Borysthenes, OTOH, may very well relate to Germanic "Bernstein", as we know that one of the eastern amber roads followed that river. So, feel free to check your area of residence for any place names that may indicate a yet undocumented branch of the pan-European amber trade network. Interesting book! I browsed through it, and especially liked the map on p.24, which is probably one of the things you meant when talking about slightly different routes (by-passing Wroclaw to the west, and reaching Bydgoszcz via Poznan). Also a good reminder that the roads of course did not end on the Vistula, but continued further into Lithuania and beyond. There certainly have been many amber roads that may also have changed over time. While amber was among the most precious goods, tradable over long distances for its low weight, most of the trade will have been only regional in character, focusing on more profane commodities such as pottery, clothing, or cheese. Even a good apple harvest in a specific region may have lead traders to change the route in order to pick up some excess supply and ship it to towns further down the road. The main (and earliest) commodity traded may actually not have been amber or metals, but salt - indispensable for animal husbandry, as well as for food conservation. I think it is no coincidence that Central Europe's dominating source of copper ingots, NW Tyrol, is located quite close to the famous salt mines around Salzburg and Hallstatt. One of the maps in my earlier posts shows an amber route from the Middle Elbe to Gdansk - not primarily an amber route, but the salt route from Halle/ Saale into today's Poland, an area notoriously poor in local salt deposits. The amber route shown on p.24 of your book would actually correspond to the eastern part (Poznan - Gdansk) of that road. From Posnan, amber/salt traders would continue along the Warta to Küstrin, cross over open land towards Berlin, and then follow the Havel to the Elbe. Below is a map of the Roman age and early medieval Central European salt route. The relation to the prehistoric amber routes is obvious. All this 'br-n' "amber" names seems to me a magic game but I 'll try to check someones, who knows? and the other is δας δαδι means like torch, punk, usage for start fire and light around. What I wonder is that were these roads existed in Bronze age times? i think is too early to speak about amber roads before 2000 BC. it is very risky to compine city names, for example Italian Brindisi is after Greek Βρεντησιον etc etc. Pärnu inE-Estonia seems coming from the german name Pernau, Pernawaina baltic language ; thistown was not on the amber road at Bronze Age because it has beenfounded in Livonia by German knights in 1251 ! Braniewo = Braunsberg inPrussia, german origin – the link with 'bernstein' seems very tinyif evêr possible ! The 'berg' element would imply an highlandsite : I 'm not aware of a 'bernstein' berg in the inlands ofEurope, if amber come from the sea ?by the fact the town wasfounded under its german name by German (Teutonic) knights in the13°century : very far from the Bronze Age ! Pyrénées (S-Francemountains) apparently a greek name : Pyrenaîa :2 suppositions: legendary Pyrene, king Bebryce's daughter or 'pyr-' derivedword with the meaning of « fire » : other legendspeaking of a big fire put in these mountains by shepherds – allthe way, no phonetic link with 'bern' in 'bernsten' ! theother places in Bern- canbe derived from a lot of celtic or germanic or others (?) ancientroots without any link with 'bernstein'- the « fire »,« well », « hill or high place», « power »meanings could by evocated for some of therm ? Interesting! However, jantar appears to be borrowed from Russian янтарь. It is also used in Czech, Slovak, Slovenian and Serbo-Croatian (but Polish uses bursztyn, borrowed from German), so it might be a generic Slavic borrowing. My online dictionary yields a second Lithuanian word, gintaras, with a more "Baltic" feel to it, but still probably having the same root as jantar. Ossetian has two words, янтарь and дзиндзи. The first is as in Russian, the second one might be related to Greek δας. I have no idea who borrowed here from whom. Anyway, crossing the Greater Caucasus, we get to Georgian kanva (Latin transcription). I am not at all acquainted with the rules that have affected Georgian sound changes, but a relation to jantar seems in principle possible. Armenian sat looks already quite distant, and from there on, I couldn't find any further traces of the root. In any case, if the word is really Phoenician in origin, it has made its way from the Levante via the Caucasus to the Baltic Sea, which brings up a number of interesting questions. Alternatively, the word gintaras is originating from Baltic languages, and has spread along the eastern amber road that is archeologically documented to have reached the Caucasus. @Moesan: Don't worry about destroying "bern-"words - as I have stated already, many of these names don't sound convincing to me either. However, I get also sceptical when location names are derived from some person that is believed to have lived there sometimes in the 11th-13th century, especially when we are talking about a location of international relevance such as the Brenner pass. It is more likely that the name relates to the Breunes, a tribe residing in the Inn valley that was subjugated by Drusus in 15 BC. So, said Chumradus Prenner de Mittenwalde may have been a "Breuni from Mittenwald". Other location names in the area, e.g. the village of Brandenberg, and the surrounding Brandenberg Alps, and Brunico/Bruneck, have probably the same etymology. Whether the name Breuni / Brenni is related to amber trade or not is of course another question. Le nom des Breunes se trouve en latin sous les formes Breuni (la plus courante) et Breones ; mais on rencontre aussi plus rarement : Brenni, Brenci, Breuci et Briones. A gallo-roman zinc plate found in Bern in Switzerland bears the name "Brenodor Nantaror" (Brenodor in the Aare valley). Your Celtic is better than mine - I leave it to you to figure out what Brenodor could mean.. Otherwise, I agree with your comments. Let me just say that Germanics near the coast have pretty low standards for what makes a "Berg"; see "Bergen-op-Zoom" or "Bergen auf Rugen". This seems part of the old italian theory that Venedi ( next to Aestii) in Prussia where neighbours to the Suebi ( Suebi where coastal confederation of people from ~mecklenburg to Gdansk ) incorporating rugii, Lemovii etc ......this is from Tactitus. ...Seems like the Vandals where not coastal. Oh, no! Suebi were people living on the Suebus river, which is the antique name of the Oder/Odra. The name was used alternatively to the Vandals. No antique geographer used both names, but they all referred to the same tribes as either belonging to the Vandals or the Suebi. From the Oder to the Aesti there is still a bit to go, and in-between settled the Goths. There is also Polish word "brzeg" and Russian "bereg", possibly from old Slavic "breg", meaning "shore" or "edge". Who knows, maybe in proto IE "bhreg or bhirg" meant high bank on a river? Germanic could retain it as "berg" meaning bank or a mountain, and Slavic "breg" as a shore? Logical scenario is that Venetic language is really Euganei language which means its Raetian language..........how else do we get Venetic, Camunic, norici, east Raetian and west Raetian languages to be ALL the very similar language. We do not expect the invading Veneti brought this language with them from Anatolia in 1200BC and taught all the alpine tribes this language...do we! Breg or Brig means hill, nothing to do with rivers or shores. Are you sure words don't have more meanings than one? How do you explain that in polish and russian "brzeg and берег" mean shore or edge? They both come from old slavic "брѣгъ". Breg = shore or edge in Albanian. Maybe it is borrowed or old IE word. East-Alpine IE: Everything that seems IE but cannot be explained by standard sound laws for Latin, Celtic or Germanic. Examples are Kortsch (from proto-IE "gherdh" = to enclose), Ziller (from proto-IE "kel"=to drive), Timme (from proto-IE "dhem"=steam), Tschars (from proto-IE "(s)ker"=to cut). Plus, of course, the later layers of Continental Celtic (Noric etc. ), Latin/Romanic (including Raeto-Romance languages, Friuli, Venetian etc. ), German, and Slavic. Aside from the facts that the relations between all these languages are heavily debated, even though we have very little material to base conclusions on, there seems to be agreement that East-Alpine IE aka Venetic was linguistically somewhere in-between Italic, Celtic and Germanic. It is of course tempting to attribute that language to the invading Veneti (which might have been Homer's Enetoi from Crimea, and give us a wonderful link to Steppe / Kurgan cultures), and ascribe the Pre-IE Mediterranean level to the Euganei. Or, the Euganei already spoke that language (it should be rather old, as it has preserved the original IE Media aspirate). No idea.. In any case, we know from Roman authors that the Vindelici around today's Augsburg (Castra Vindelicorum) - a name that appears quite "Venetian" - spoke Celtic when they were conquered by the Romans, and their language was different from the East-Alpine IE spoken by the Breuni around the Brenner. It seems language shifts around the Alps may occur quite fast, but traces of the older languages will always remain. I guess you, as Alpinoid, were already aware of this.